Çölü Yeşillendirmek – hira d.
Edible Forest Gardens, Dave Jacke; Chelsea Green, 2005. How to make a Forest Garden, Patrick Whitefield; Permanent Pub., 2002. Beyond the Forest Garden, Robert Hart; Gaia Books, 1996. Forest Gardening, Food Forest Book; Jade Woodhouse, 2003. The Permaculture Home Garden, Linda Woodrow; Viking, 1996. Creating a forest garden, Martin Crawford; Green Books, 2010. Agroforestry for Soil Management, Anthony Young; CAB/ICRAF, 1997. Forest Gardening, Robert Hart; Green Books, 1996. Bitkilerin Gizli Dünyası 1-2-3-4, H. Kemal Çağın; Bulut Yayınları, 2004-2005. Food Not Lawns: How to Turn Your Yard Into a Garden and Your Neighborhood Into a Community – Heather C. Flores; Chelsea Green Publishing; 2006. 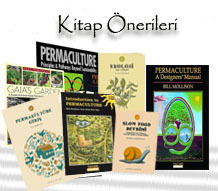 Türkiye Bitkileri Listesi (Damarlı Bitkiler), Ed: Adil Güner; Nezahat Gökyiğit Botanik Bahçesi; 2012.